Happy Birthday! No… wait. That’s not right. I’m forgetting something. Oh, I know, HAPPY BLOGIVERSARY! I know, I know, technically the first blog entry was August 3rd. But let’s be honest, “blogiversary” is pretty much a made up word, so I think we can be a little loose with the rules. About 7-8 months into blogging I thought about doing a fun giveaway, or a special post or blah blah blah to celebrate my year of blogging. Well, as usual, Erin forgot. I am literally, one of the most forgetful people I know. (Unless I’m forgetting someone.) My family and friends can attest to that. If you click through my old posts, you’ll see it actually took me quite a while to get the hang of what I was doing. I feel my writing has improved (imagine that, me enjoying writing), and of course the photography has DEFINITELY improved. But most importantly, my cooking & baking skills have really improved. I suppose the best way to learn something is to put yourself out there publicly. I always say, if I can bake/cook something, then anyone can! And this applies to other things too. Surely if I can learn to bake a loaf of bread, then you could learn to play the guitar like you’ve always wanted, grow your own vegetables, learn the rules of soccer by joining a team, or how to sew your children’s clothes. I hope my kitchen adventures have inspired you to step out of your comfort zone and try something new! One new skill I highly recommend is baking from scratch. Though there are still times I might rely on a boxed mix, those times are getting fewer and far between. When our nephew came to visit us, he & I made brownies. He was so proud to tell his Grandad & his mom that we did it together “and didn’t even use a box!”. That really made me smile inside to hear him say that. There’s a certain sense of accomplishment knowing I didn’t take the easy way out. Not to mention, nine times out of ten, it’s going to taste better! I can instantly tell if I’m eating a cake that came from a mix. And honestly, I’d rather not waste the calories. Also, I’d say probably eight times out of ten, it doesn’t take a significantly longer amount of time to make something from scratch. We’re talking a difference of 5-10 minutes. Okay, I’m going to get off my soapbox now, before I sound too “Judgy-McJudge”. I don’t judge people that make cakes from a mix. (In fact I recently re-made this recipe, per request.) Those kinds of cakes still have plenty love in them! More love than picking up cupcakes from the grocery. And cupcakes from the grocery are still better than nothing. Let’s face it, we’ve ALLLL had those days when that’s all you have time for. I’m just hoping I have inspired you to step outside your comfort zone, and maybe just try a cake from scratch! Now, onto THESE cupcakes! The best part about baking from scratch is, different recipes have different methods, and different results. These cupcakes were very different from my stand-by chocolate cake recipe (used here, here, here, and here). The methed is totally different, and the taste is completely different as well. My other recipe results in a cake that is very moist, with the exposed edges/top/bottom being so incredibly moist and wet, it’s shiny. This recipe yielded cupcakes that were much dryer. But don’t think that means this is a dry tasteless cake. It’s far from that. It’s a dryer texture, but it’s still rich and chocolatey. The chocolate flavor is much more intense in this recipe. It’s more complex, and is a more crumbly cake. Again, it’s not dry in the sense of being stale, but dryer in a good way. Part of the complexity comes from the use of bittersweet chocolate. This helps cut the sweetness. If you, or someone you know, enjoys desserts that aren’t as shockingly sweet, this might be a good one to try. The original recipe calls for it to be topped with chocolate glaze, and while I think that would taste great, I actually had cream cheese frosting hanging out in my freezer, leftover from the Zucchini Spice Cupcakes. It ended up being the perfect amount for these cupcakes. This recipe came from my Perfect Cupcakes book, which a reader so thoughtfully found and shipped to me (Thanks Brienne!). It says it yields 6, but I swear I got at least 10 large cupcakes. I recommend this recipe if you’re looking for a deeper, more intense cupcake that’s not as wet as Hershey’s Perfectly Chocolate Cake recipe. And, if you’re looking for a recipe with a smaller yield. Preheat oven to 400 degrees. Prepare a muffin pan by greasing or inserting liners (recommended method). In a mixing bowl, use a hand-held mixer on medium-high speed to beat the butter and sugar together until light & fluffy. Add the egg and beat well. In another bowl, whisk together the flour, cocoa powder, and baking powder. In alternate batches, stir the melted chocolate, dry ingredients, and milk into the butter mixture. Distribute the batter among the prepared cups. Bake until the tops spring back when lightly topped, about 20 minutes. Cool in the pan for 5 minutes, then turn out onto a wire rack to cool completely. Serve warm or cool, topped with frosting. Happy Blogiversary! These cupcakes are so festive and adorable… would you mind sending me one? Happy blogiversary! Yes, even if it's made up, it deserves celebrating 🙂 Nothing like sprinkles to make a Monday morning better! Happy Blogiversary! Such drooling cupcakes. And marvelous photography. Happy Blogiversary! Great pics of the cupcakes. Those are adorable! And happy blogiversary- always exciting! Those are super cute and sound delicious. Your photography is beautiful too. The cupcakes are great and sound delicious. So fun! And I love the corn ice cream too! Happy Blogiversary! 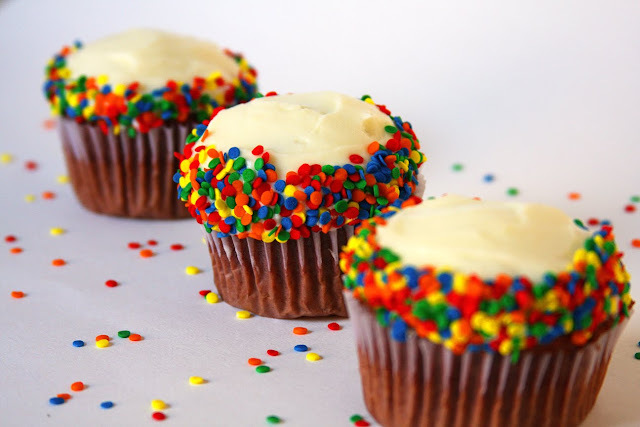 Love those cupcakes with the cute sprinkles! Happy Blogiversary! I LOVE the sprinkles. These cupcakes look like something you'd find in a cupcake shop! YUM! These look so chocolaty and delicious! They look so pretty- I love the sprinkles! Happy Blogiversary! Happy Blogiversary!!! I'm suddenly having a strong craving for cupcakes with sprinkles. Thanks for all of the great recipes and inspiring me to step out of my comfort zone. Even if it is just baby steps. Happy Blogiversary! Great looking cupcakes, and I totally hear you on the baking from scratch. I've never been much of a baker until the last few months and what a difference – it's so liberating to just say "hmm, I want brownies" and whip up a batch rather than running out to the store for a mix. Happy blogiversary! The cupcakes sound delicious and look so cute! Happy blogiversary! Great cupcake pics! Happy Blogiversary! These cupcakes are a great way to celebrate. 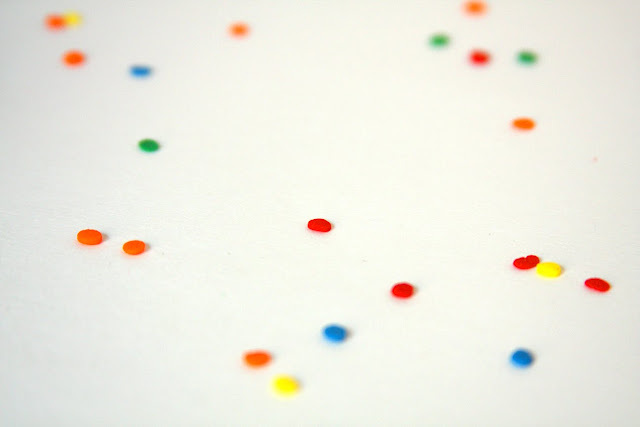 I love the sprinkles! Happy Blogiversary! 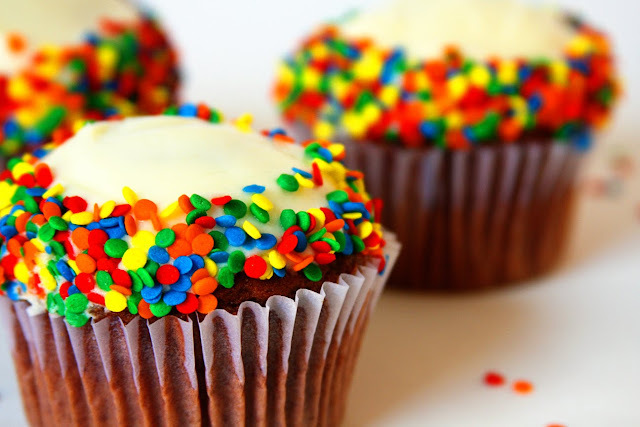 Your cupcakes look so colorful and fun! Happy blogiversary! I missed mine too! I haven't baked anything from that cookbook. I've just been drooling over all the possiblities! 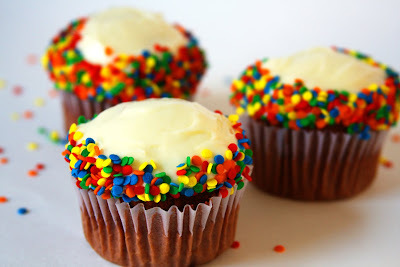 Btw, I like how you rimmed them with sprinkles. Happy Blogiversary! I LOVE THE SPRINKLES! What a cute way to do sprinkles!! Just made these turned out awesome! Yay! Thanks for the feedback!